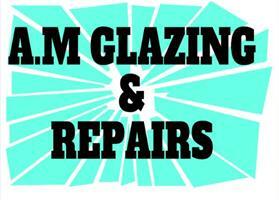 A.M Glazing and Repairs - Fascia/Soffits/Guttering, Locksmith, Windows/Doors/Conservatories based in Wokingham, Berkshire. Invoice history based on 877 reviews. I started my career aged 16 as a fabricator with a well known, leading window/conservatory company. For the last twelve years I have built up a reputation as a leading local glazier/locksmith. I offer a fast, friendly service with 100% quality workmanship. I also sub-contract off of several local companies who use me for securing and installations, also a full locksmith supply and fitting service. I have also undertaken several training courses over the years and I can repair instead of replace in 9/10 cases. I can repair damaged frames including break in and attempted break in marks, fire damage and screw driver and scratch marks with ease. Also replacement hinges, handles, locking mechanisms, misted units and discoloured panels. I'm a one man band so can undercut and beat any estimates within reason if your put off from the big and global companies with their higher fixed rates and pricing methods then I'm the contractor for you. Planning - we can plan your installations from start to finish with full colour books and samples. Once you have chosen your styles and design you can leave the rest to me and my team of experts to ensure your house is fully transformed. Building work is also undertaken from brickwork cut outs to lintel installations. We offer free estimates and advice. I have over 15 years experience in the glazing fitting and locksmith trade. Thank you for taking the time to read about my company and services and look forward to meeting new and existing customers.